To St. Malo for a couple of days with Brittainy Ferries from Portsmouth, a smooth journey in an ensuite cabin that surpassed my expectations. The food on board was delicious – and very inexpensive for the quality. On offer was a buffet with main course served separately from the grill, an a la carte menu, a snack bar and a self-service restaurant – choice enough for everyone. 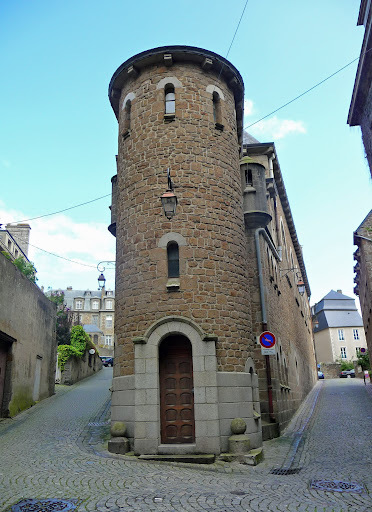 Unfortunately, the first morning in St. Malo brought winds and rain, and when I say winds, I mean icy cold winds that cut through my three layers of warm clothing like a Siberian dagger. 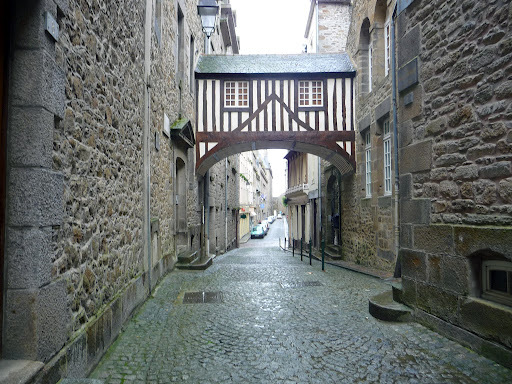 Foolishly ignoring the advice of the hotel receptionist, we took ourselves off on a tour of discovery, only to find that nothing opened before 10 a.m. in St. Malo – not even a coffee shop – so we had the wet, cobble-stoned streets to ourselves as we perused the soggy map trying to negotiate the lanes, alleys and squares of this granite island. Down one side-street we managed to locate a coffee shop which served delicious chocolate and croissants so the morning took on a more cheerful aspect. By midday however, the sun was out, the sky was blue, and it was smiling Gallic faces all round. 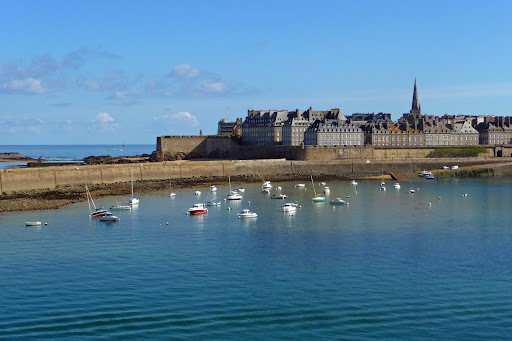 Saint Malo surges up from rocks and curves to form a natural harbour. The Cathedral which we’d earlier visited (partly to escape the rain) dominates the skyline and is a good marker if one gets lost. Despite the religious symbol however, the city has a somewhat shady past, being the haunt of Barbary pirates in the 18th and 19th centuries who preyed on the ships crossing the channel. 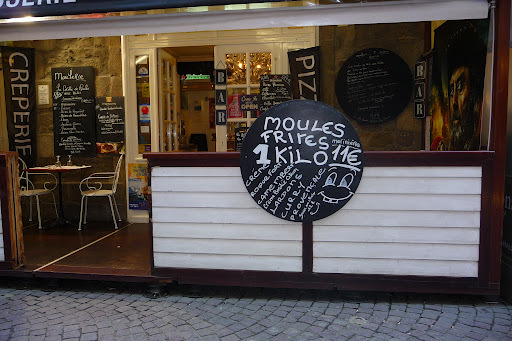 It would be a good idea to take La Petit Train de Saint Malo for the 30 minute sight-seeing tour – a good 5 Euros worth – before embarking on a walking tour with a map, as this tours the walled city and the surrounding port and includes an English commentary. Visitors to the town can see quickly where the landmarks are and make a note as to what they would like to return to see when time permits. The heart of the city is the old walled town known as Intra-Muros (inside the walls) and a favourite walk is on top of these 20-foot thick walls. From high above town and beach one has a magnificent view of the surrounding area and down into the maze of medieval streets. 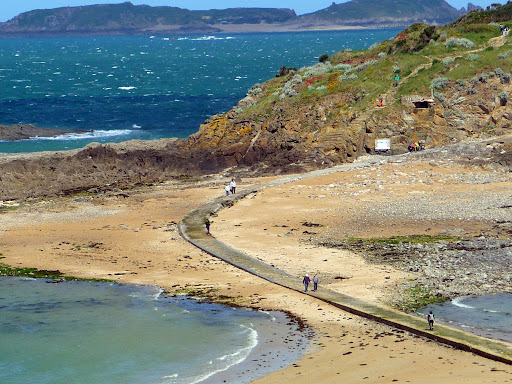 A stretch of approximately one and a half miles can be walked and despite being buffeted by the wind, it was a joy to gaze on the golden sands of St. Malo which stretch right along the Brittany coast, watch the parties of schoolchildren wander along the water’s edge, and the hardier folk who were hurrying along the stone-flagged causeway to Grand Be islet (don’t attempt this if the tide is coming in: if you do, then you must stay on the island until it goes out again). In a town known for its fish and seafood it can be a problem to decide where to eat, so many are the good restaurants on offer. One row of restaurants backs on to the walls (Rue Jacques Cartier and Place Chateaubriand) and this seemed to be most people’s favourite place. And do try a Kir Breton (Kir and Breton Cider). 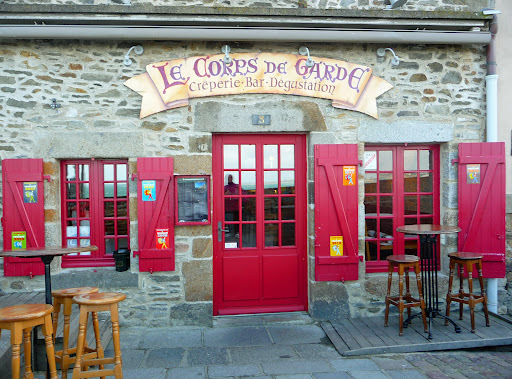 Most people, for lunch and dinner, seemed to be opting for moules in all their forms washed down with either local cider or white wine, followed by crepes for dessert. 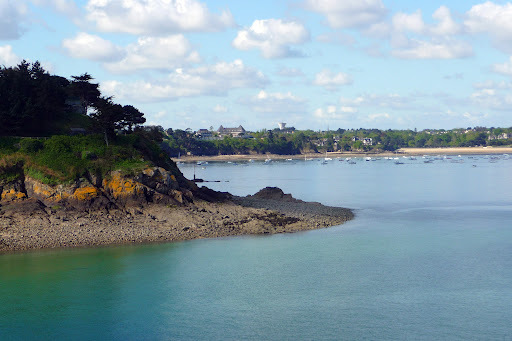 The weather didn’t encourage sea trips but bus rides to nearby Dinard and Dinan were easy to arrange. We were temped to take a taxi to Mont-Saint-Michel for 85 Euros but decided against it not knowing what the weather would be like. Next day we sailed back to Portsmouth on the Bretagne with the sun shining fiercely from a blue, blue sky. It was ‘on the deck’ weather the whole way back and I’ve already made up my mind to do this trip again. So enjoyed my own visit here. It is such a nostalgically sad and tranquil area. Agree with you about the seafood: too much of it made it difficult to decide what to have! Love your first photo of the town view.